The Mercenary Wingmen are all using webs and have high shield regen, while the Mercenary commanders have a slightly higher DPS. I was able to complete this pocket in a Ferox by concentrating fire first on the commanders to reduce the total incoming damage to a manageable level and then following through in the wingmen. Also I have noticed that the wingmen are able to switch their fire to your drones even if you are already aggroed, so be careful. Despite from the Elite drone AIs in the wreck "cargo" section the elite drone wreck yields only metal scraps as salvage. Since they disappear really fast (<15mins IMO), get as close as possible before opening fire and loot as soon as you've made the kill. Please refrain from editing the main article unless you can provide details of the exact ships types and have done this mission more than several times to see the ship patterns. Pocket 1 - Group 3 ship mix randomly varies. The problem is, that Mercenaries needing kinetic som damage type. It works with drones too. So I recommend the main damage types thermal and kinetic. This should be approved by someone. Mercs need Thermal as listed. Drones need EM as listed. If you only want 1 damage type go EM as long as you've got decent skills they drop quickly. If you are in a ship that uses drones use EM/Thermal drones should be fairly easy. I used a raven and Paradise cruise each time and it goes quickly enough the tank holds. I just ran this mission today, the Elite Drone Parasite wrecks lasted for well over a hour. As well, I was successful in salvaging them for normal salvage components, and not metal scraps. Elite Drone Parasites have low tracking. orbiting at 350ms at 35km prevents more than 60% of damage. They also have 2 defender lauchers. battleships do heavy damage at close range, but die pretty fast. Should be killed at appropriate time. Mission is doable with ~200hp/s effictive tank with appropriate resists. Had to warpout after clearing pocket 1 to switch resists. The Drone-Battleships can be killed much faster with kin-damage than with EM - at least thats what I found out with my Drake (with kin-bonus). Shields take a little bit more EM-damage, but on Armor I did just 40+ damage with my Thunderbolt heavies (EM) compared to 100+ with the Scourges (kin). I think the reason for confusion about 'dissapearing Elite Wrecks' thing is they come up as Rogue Small on the Overhead Display, while they come from BS sized ships. The gate to pocket 2 is now just 5km away from the warp-in point in pocket 1, rather than 53km, as it was previously. Speeds things up a lot if you're in a slow battleship. Uploaded the modified screenshot from pocket 1 from DamithdEstelas. Pocket 2/Group 2 -- there is a limit beyond which the Mercs will not travel. They turn around and go back to start locations when they reach it. Even the OverLord proved to be faster than my Nighthawk without an AB. Pocket 2 has four widely separated, small Omber 'roids. (1200 units each). Imo, not worth the effort to mine these. NOT a blitz if you HAVE to kill ALL 30+ ships before the second gate is accessible. I just dropped out of warp right in the middle of the group with the Sentries. That was around 79Km away from the gate. Last time, I nearly stumpled over the gate when warp was finished (like noted by DamithdEstelas). (Pocket 1 group 4 )they are just flying away from me seems you now need to fit an Afterburner. anyone else had this happen? I can confirm that the first warp you initiate to the mission will bring you to the sentry blob and the second will bring you to the gate. It's really annoying to be honest. I can't confirm the info from DrugsDen. My group of 3BS flys at max 55m/s and I'm able to close in on them as I fly to the gate. Quite an easy mission, finished with a Drake (res: 81% therm, 68% kin, 10% EM), used kin heavy missiles. This time I ran this mission, I dropped out of warp close to the gate and about 70-80km away from the sentry-blob. I can confirm GeorgeSheng's comment about 4 groups in pocket 2. I had the same experience by attacking the cruisers (only aggroed Yarl Uzbeki). I just ran this mission, attacking group 1, 2, 3, and 4 in that order did not aggro other groups. Came into mission expecting that attacking either group 2, 3 or 4 would aggro the other groups, but it did not. 2) in pocket two wait until the autoaggro group has started shooting you and then only shoot them back to clear this group - I accidentally shot a frig from other group and pulled the aggro of two groups. As long as you manage the group aggros separately it should not be a problem even for a low SP character (like me) - but I had to learn it the hard way. I highly recommend nemesis as a good offensive ship (requires a second ship, fast decoy, or drone boat with reppers, etc. I used the ishkur. ). With 3x torp launchers you can volley ~1800ish DPS / 9 sec with medium-ish torp skills. With torps, this damage comes in all four flavors. For the Pocket 2 (Mercenaries) the guide says: "Recommended order for elimination : Group 1, Group 2, Group 3 and finally Group 4." I would warn that attacking Group 1 before auto-aggro spider drones have arrived pulls all the groups in and gets you killed because of warp scrams. So wait for the spider drones 1st, if there are any. They move like 1+ km/s. Pocket 2: Monkey read monkey do. Done in a T2 fitted Rokh. (Normal/be careful though) Alot of web. drones attacking stations usually means that the firepoint is far outside the drone's range even when they're orbitting as close as possible. try sentries when attacking a station. Astonishingly enough, I had by far the best damage results using Kinetic T2 Missiles on the Elite Drone Parasites in Pocket 1. I was flying a Caldari Navy Raven, so no ship bonus on kinetic damage applied. Perhaps someone else could try and confirm? Done in a Megathron, 2x CCC, 1x Auxiliary Nano Pump, AB II, 2x Cap Rechargers, 1x Cap Power Relay, 1x LAR II, 1x Armor Kinetic/Thermic Hardener II, 1x DC II, 2x Magnetic Field Stabilizer II, 7x 425mm Railguns, 1x Tracking Computer II (a webfier may be more useful for pocket 2, see below), Faction ammo and Amarr Drones (Infiltrator and Acolyte). The first 2 Battleships from pocket 1 can do some damage, everything else from this packet is fine. Initial group of pocket 2 is the hardest part of this mission. You will be webbed in a few seconds by the drones, then by the Frigates. Wait until you are attacked, so you don't aggro another group. Make sure you are attacking the correct ships (there are about 30), engage the Cruisers with your guns, and have your light drones pick the webfier drones, then the Frigates. Next time I'll try fitting a webfier to help my drones destroy the attacking drones and frigates. Rest of pocket 2 was rather easy. Pocket 3 was also of no concern, engaged all towers and had my medium drones pick up the Cruiser once it was in range. Took around 45m to complete the mission, 25m to salvage. 2.5M isk of rewards, 3M isk of bouties, 2200m3 of loot (including Alloys/Compounds from drones, very little and up to Zydrine), 5x Elite Drone AI, Salvage includes Circuit Boards/Melted Capacitors/Metal Scraps. Not an impressive isk/h mission. at one point in this mission I had 5 webbers on me. Max speed was 1.8 meters a second. Aside from an (apparent) server/client desynch that held up my warp-out, i had no problem finishing this mission. Passive T2 shield tanked rokh with 425mm Scout cannons. The Road House in the final room contains approximately 3 mil worth of modules. Don't forget to blow it up. Completed in Caldari Navy Raven. First pocket was touch and go but pulled through. Completed again in CNR. Just wanted to add that the second pocket hit you very hard even with good EM resists. I had 2x Photon Scattering Field II and 1 x Invuln II and I could hardly hang about any longer. I did make the mistake of using missiles against the battleships and light drones against the small frigates. What I should have done was use missiles and medium drones to take down the cruiser sized targets ASAP - since they seem to do far more damage than the others. Room one, drone sentries will switch agro to drones. Suggest taking them out first if you are using drones. I've run this mission twice recently and there has been no pleasure hub in the third pocket. Has this been removed or is it a random spawn? I believe the Pleasure hub may now be a Roadhouse, It explodes instantly, but dropped nothing but junk for me. 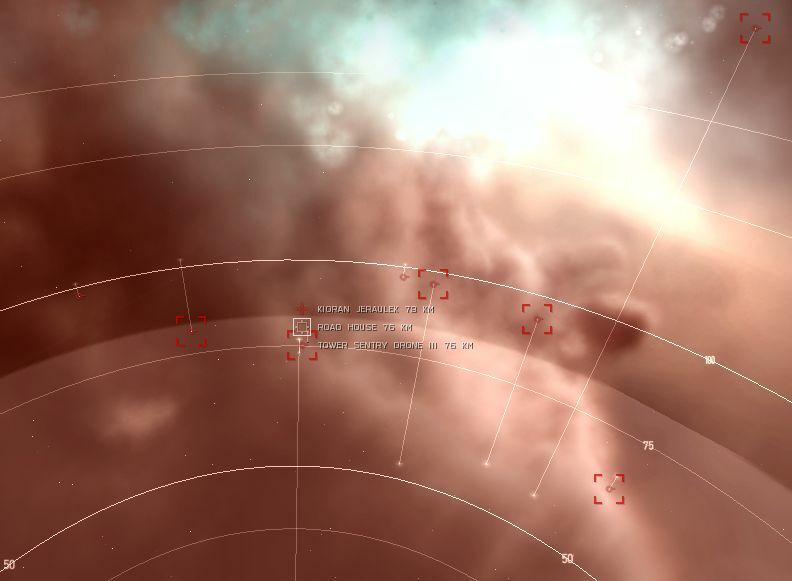 From what is written on http://games.chruker.dk/eve_online/ , I'd suggest Explosive damage against the BS because their armor has lots of hitpoints and lowest resistance there is Explosive. Shields have higher Exp resistance but low hitpoints so... obvious choice. The cruiser/bcruiser class ones seem to be vulnerable to (surprise!) EM damage. Pure EM works best. Since you'll normally do the tower drones last they don't really matter. To kill them fast use Thermal damage. Update: sentry drones in Room 1 can be killed by your drones without aggroing the pocket. I found the Elite Drone Parasites to hit VERY hard. I have 89%/81% resists for Therm/Kin respectively. Luckily my drones managed to destroy them all before needing to warp but I was certainly getting nervous. This is with a fully tech 2 tank. The Elite drone parasites are weakest to expolsive on armor and EM on shield. Jeese. This mission is one of the easiest out there. I've been doing it for atleast 5 years. CNR 1 Invul II, 1 Photon, 1 Kinetic, 1 Thermal, XL booster, Sensor booster. Stage 1: aggro the 2 Elite Drone Parasites between you and the cruisers. Kill them. Then aggro the Cruiser class drones. 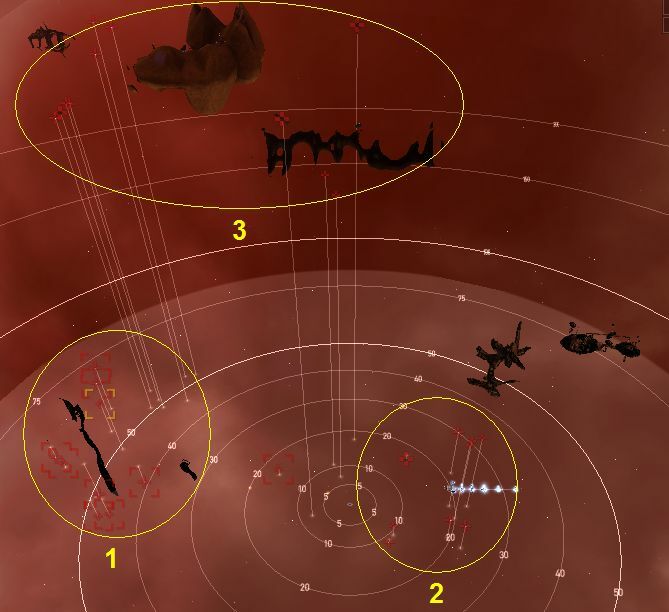 Launch your drones and let them handle the cruisers while you kill the remaining 3 Elite Drone Parasite BS's. Stage 2: When you land, the group of cruisers/frigs behind you will aggro, Kill them when they spawn starting with the cruisers. DO NOT WORRY ABOUT THE FRIGS. Once the commanders are dead, kill the mercenary Overlord and commanders that are infront of you. Once you have aggrod this group, it is safe to launch drones and let them handle the frigs. Once the commanders and overlord are done, kill the 2 named bs's directly above you. Once they are dead, kill the remaining group of commanders and named BS. Stage 3: when you land, just start popping sentries while you want on the informant to approach you. Very easy mission over all. I strongly disrecommend this mission to low sp amarr laser users, the mobs and sentries are highly resistant, and additionally the payout is not that great. For Caldari pilots- go with straight Thermal damage on this one. Best all around. If you're a missile user, don't use EM ammo on the Elite Drone Parasites. If you're in a kinetic damage bonus ship (such as a Tengu) I recommend Kinetic missiles against the drones. I nine salvo the Elite Drone Parasites in an HML Tengu. Pocket 2 has veldspar asteroids rather than omber. HillAnt was right. Very hard for non-highSP Amarr pilots. Decline and get another mission. It's not true about the Amarr thing. I'm a new pilot, playing for 45 days, 2.2M SP. Done with Apocalypse 2xT2 Therm, 2xT2 Kinetic Hardeners, Large Armor Rep II, T1 drones, 4 cap recharger II, 3 ccc, needed 2xBeta Control unit for PG. BS only lvl 2, Large Energy turret lvl 2 too. I have the apo only 4 days. The mission was 50 minutes without salva, but armor never went below 75%. Drake takes it easy when managing aggro properly. BTW, Kioran Jeraulek in last pocket is webbing, nasty issue as Sentries III have quite a DPS and hits always. After Escalation [April 2012] the Rogue Drones now have bointies totaling 1.44m but no refinable loot. To clarify, the second and third pockets do have loot because there aren't any drones. Just got over 20m of loot & salvage from them. Completed in megathron with rails--I shot each group in the order listed on this page, and never got aggro from any other group. I also didn't move while I was fighting. Hobgoblins took out all of the frigates pretty easily, and everything else died pretty quickly even to long range ammo. The incoming dps was pretty high in the second pocket, but a buffer fit was more than enough to finish everything off. I think megathron should be added to the suggested ships list. When I do this in a Sleipnir, I've found it worthwhile to switch to 425s in the second level while using 720s in one and three; I find I can down all but a couple of the gnats quickly with guns and get back up to speed with only some assistance from my drones. Did this 2 times, no auto-aggro in pocket 2! AWWW come on - Drones = EM Mercs = Thermal get your damage to deal right! In a Raven with Cruise Launchers, and using the damage tables above I switched to two sets of damage types; one set of missile launchers to take down the shield and the second the armor. Once the shield was down, I switched targets and then picked off the armor with my second missile launcher set. That made a huge difference in the speed of taking these down instead of the generic 'use thermal'. For example in the last pocket I used EM for shields and then Explosive as it has the lowest resist for armors. It's more work and can be unnerving at first, but once you get the hang of it, speeds things up a bit. I felt like trying, so I took the time to blow up the structures. of hit points - dropped anything, the only exception being the Roadhouse, which dropped 5 Metal Scraps. Dominix, T1 Light+Heavy Drones, 2 reps, 3x350mm guns..